A few years back I put the finishing touches on the 1978 Topps set. It was a labor of love, and not because it was my birth year (I was born in 1979) or because 1978 was a year of any real significance to my childhood (see the aside about me not yet being born)—I went all out and put this set together because Eddie Murray was my favorite player as a kid. Let me clarify. Eddie Murray was my favorite non-Red Sox player. Dwight Evans was my favorite Red Sock. I had got Murray’s rookie at a card show at the Watertown Mall when I was 12 or 13, purchased in a dealer-assembled pack of rookies. Murray was smirking on one side and Mark McGwire’s awesome 1987 Donruss Rated Rookie was on the other. I remember I paid $14 for it, dumped the other cards in a box at home and sat mesmerized by Murray’s glare. In the course of putting together the set, I spent money on about 50 commons it turned out I already had, and many fruitless hours trying to pry my beat-up Murray rookie out of its seal-tight plastic case so that it could take its rightful place in the binder next to Sparky Lyle. I also remained two cards shy of a complete set for a long time because I couldn’t find either the Royals or the Dodgers team cards for under 50 cents apiece (turns out I wasn’t looking hard enough in the right places). The set’s really a beauty (for some reason that scripty letterman’s jacket team name font gets me somewhere between the throat and the gut), full of comically bad portraits, atrocious airbrushing, multiple cards of Hall of Famers, and, like all the other late Seventies sets, chock a block with stars history has somehow forgot (like Ellis Valentine). If you have no idea who Valentine is, you’re not alone. I had to read “The Year the Expos Finally Won Something!”, a horrible clip job by Brodie Snyder about the star-crossed Expos of 1981 to find anything out about him. Valentine was a power-hitting All-Star, a fan favorite, and most importantly, a shadow of himself after injuries in his prime. That the Expos were able to pluck Jeff Reardon from the Mets in a trade for Valentine is a testament to his talent on the field. What’s also interesting about Valentine is that he and Andre Dawson were the same age, came up through the same organization, and were both incredibly and similarly talented. If you compare their stats from 1978 and 1979, they’re practically identical (Dawson had more speed, while Valentine had more plate discipline). Had he not been repeatedly injured, the Expos of the early 1980s could have fielded one of the best outfields of the last 30 years in Dawson, Raines, and Valentine. There are other overlooked stars who shine in the 1978 set. Ray Knight’s rookie floats in there somewhere, as do Warren Cromartie’s and Bob Stanley’s, and practically the entire roster of the 1984 Detroit Tigers. Ron Guidry is in full effect on card #135, en route to one of the best post-Koufax/pre-Pedro years of pitching dominance. Ruppert Jones, coming off his All-Star season in 1977, looks pensive on card #141, and Dwight Evans—perhaps the most-overlooked star of the 1970s and 1980s—quietly stands pre-mustache in the far corner of the set at card #695. Could 1978 Topps itself be overlooked? Could that be why I like it so much? Well, for one thing it’s hardly unpopular. It’s a low-priced mecca for cards of Hall of Famers and other timeless superstars (the Pete Rose was double-printed, for crying out loud). For another, you can find these cards everywhere, so it’s not as if it were somehow erased and forgotten like that betamax tape collecting dust in your storage unit. No, I like it because it’s a talisman, an inroad to learn about the game during a forgotten, overlooked time. Seriously, can you name an important feat that occurred between Reggie Jackson’s three World Series home runs in 1977 and George Brett’s pine-tar incident in 1983? [Editor’s note: Yes!] I consider myself something of an amateur baseball historian, and only two things immediately come to mind: Bucky Dent’s homer in the playoff game between the Yankees and Red Sox in 1978; and the Pirates winning the World Series in 1979. Oh, and the short-lived brilliance of Ellis Valentine. I remember hearing rumors that Valentine had a bad cocaine problem. I have no idea if that is true or not. Maybe some of the readers have some better insight on that. The thing about Ellis Valentine was that he had a bazooka for a throwing arm, this is probably the first piece I’ve ever read about him that doesn’t mention that. I was at Shea Stadium watching a Mets game the night the Mets traded for him. They put the announcement up on the scoreboard to resounding cheers. I never read Brodie Snyder’s book, but in a desperate act of journalism I once called Snyder on the phone, looking for anecdotes from the brief playing career of Jerry Manuel, who was also a 1981 Expo. Snyder’s wife gave me the number of a hospital where he was being treated for something or other, and I reached him and spoke for a few minutes, very nice guy but didn’t have a lot on my subject. Yes, Valentine did have a drug issue at one time, I don’t recall if it was during or after his playing career. I read somewhere that he’s an addictions counselor today. Besides the cannon arm, he also (as ’70s Strat-O-Matic fans know) CRUSHED left-handed pitching. People also make a big deal about a beaning derailing his career, but I think that point has been disputed. I like the ’78 set as well. The ’77 set was just too cheap looking and bland for my taste so ’78 was a nice change. Plus, ’77 had a ton of bad air brushed Mariners and Blue Jays. ’78 was the first set that you actually saw what the Blue Jay & Mariners looked like in card form. I loved the ’78 manager cards when I was a kid because it had a small b&w photo of what the managers looked like when they were players. There was a time in the late 70’s that it looked like Ellis Valentine was going to be the huge star not Andre Dawson. From 77-80 he was really a top notch player, AS, GG, ops+ of 124, 128, in ’77 & ’78. Then in 1980 he was having his best season with a 147OPS+ and he was hit in the face and broke his jaw. He never was the same player after that incident IMO. Who knows, if Valentine didn’t get hit in the face, the Expos win the N.L. East. The Expos history is filled with all of these odd twists of fate and it really seems like they were a snake-bitten franchise. If 4 or 5 things had turned out differently they may won 3 or 4 divisions and won a WS or two. Author Robert B. Parker just passed away. I read and enjoyed many of his Spenser books over the years. I know that Robert Uhrich played Spenser in the TV series, but my mental image of Spenser has always remained as Dwight Evans (with mustache). 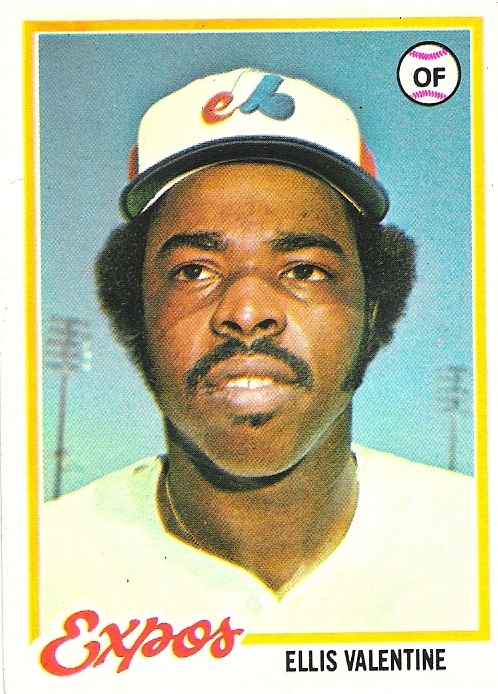 Valentine wore one of those half football mask jaw protectors after that incident, as seen on his ’81 Topps card. great post. i had this set, purchased pack by pack! it’s not an amazing year but i agree re the expos’ young outfield. they were really exciting and i once saw warren cromartie hit an inside the park homer at shea during a double header. ellis valentine had a great arm too. and another thing, dewey evans was not underrated. darrell was! I was checking Ellis Valentine’s splits of the 1980 season and he actually got BETTER after he came back from the beaning. His last game was on 5/30/80 and then he came back on July 10, 1980. Now the Expos most likely win the division if he doesn’t miss 6 weeks but the beaning doesn’t affect him in 1980. Now maybe there was a residual effect in 1981 or maybe it was a combination with his drug problem that started his slide. I love the 78 set. It was the first year I remember getting cards. I was able to recover some from home and many many 1979-1984 cards from my parents home before it was sold. I had taken some of my best cards and hid them in a part of my cellar and some of the 78 cards were eaten by some bugs. I started collecting cards again then and completed the 78 set and some other sets thanks to ebay and sportlots.com. Then I stopped buying more when I ran out of time to organize the ones I had bought. I am hoping to employ my daughter in this task in a few years (she is 6 now). Count me in as another guy who loves the 78 Topps set. Easily my favorite of all time… not so much for any particular baseball reason… but just the perfect combination of era and design. You still had great afros and facial hair and gloriously bright polyester unis… and the set was also a high point from a design standpoint. Compared to the other 70s sets… you had too garish (1975) or sorta clunky (1977) or too busy (1972) or just downright dull (1979)… this set was borderline elegant. That great script spelling out each team in the lower corner, the simple thin border allowing for a larger player picture… The only slight knock is that baseball position indicator in the upper corner intruding on the otherwise clean, let visually interesting, design. It’s something that would have worked just as well in 1988 or 1998 as it did when it was issued… and that’s without any nostalgia induced irony required. I still will occasionally google this set… ready to pounce on one if I can find it cheap enough.